Serj Tankian has gone through his archives and picked out an early track titled Industrialized Overload to thank fans for their support. 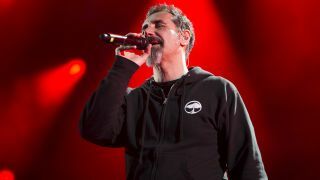 The System Of A Down frontman has worked on several film scores over recent years and recently reported that he was “tired” of writing vocals. But Industrialized Overload features Tankian singing and it’s available as a free download from his website. Tankian says: “Dear Friends, I want to wish you all a healthy, happy, restful and joyful holiday season. As an artist, I am truly grateful for your continued support. System Of A Down’s last album was 2005’s Hypnotise, with bassist Shavo Odadjian admitting over the summer that he had no idea when a new record would arrive. His comments came after drummer John Dolmayan said he was disappointed that work on their sixth album had stalled, despite previously reporting that the band had “about 15 songs” in the works.